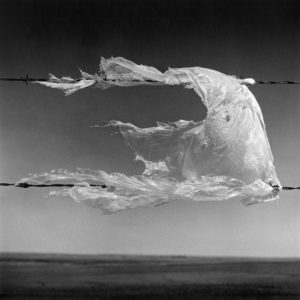 In a state of contemplating mortality, and in the context of his mother’s terminal illness, these shreds of plastic took on deep significance to Bell. Snag became a three-year project by the celebrated photographer from Medicine Hat. These poignant and melancholy photographs manifest as multilayered, emotional metaphors. The series unfolds as an emotional journey. The works trace the walls of the Gallery, intersecting around corners, emulating the chilled and windswept roads from which the images were captured. 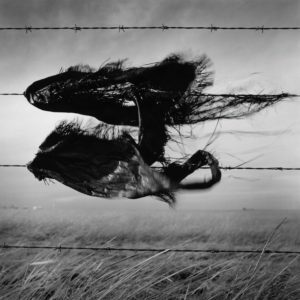 The linear aspect of the work is significant and reinforces the artist’s vision; to reflect the flat prairies where this project was born, and to describe his own passage of grief and acceptance. Shot using black and white analogue film in a medium square format camera, the images are transferred onto warm-toned, fibre-based photo paper. Bell creates a stark material presence that would be impossible to achieve digitally. Bell’s depictions of the seemingly lifeless period between winter and spring capture the poetic, emotional purgatory that exists between life and death. 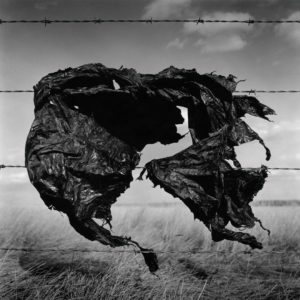 Image credits: Wes Bell, Snag–11th Avenue N.E., Medicine Hat, AB, Canada, silver gelatin print, 16 x 16”, 2015; Wes Bell, Snag– Box Springs Road, Cypress County, AB, Canada, silver gelatin print, 16 x 16”, 2016; Wes Bell, Snag–23rd Street N.W. Medicine Hat, AB, Canada, silver gelatin print, 16 x 16”, 2015.